Hi there! Welcome to the Share our Strength (SOS) Share Our Holiday Table progressive dinner! What is Share Our Holiday Table, you ask? Well, it’s a virtual progressive dinner party in which over 50 bloggers are participating! Share Our Holiday Table is a fund-raising event to support Share Our Strength’s, ‘No Kid Hungry Campaign’ to raise awareness of child hunger in the U.S.. The dinner party will begin today and last throughout the entire week. After hearing about this great fundraiser, I just happened to be sitting at my dinner table and looked across the overflowing bowls of food to see my two lovely girls happily chatting and abundantly serving themselves. It made me stop and think. I was struck by how much I take for granted. I then tried to imagine my own two children sitting at our dinner table staring at empty plates with nothing to eat. My heart sank, my eyes stung with tears and I knew what I had to do. I just couldn’t imagine how awful it would be. So today, by participating in this dinner, I am joining a team of many to help put a stop to child hunger. 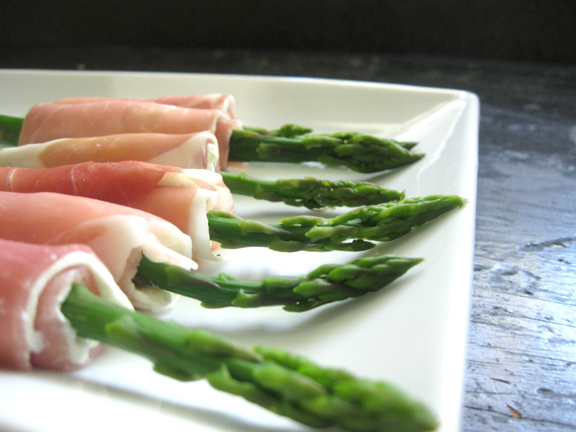 I have chosen to bring prosciutto & cream cheese wrapped asparagus packages to the table. They are so easy and delicious. AND these little gems are gluten-free. It is such a simple yet elegant addition to any meal! 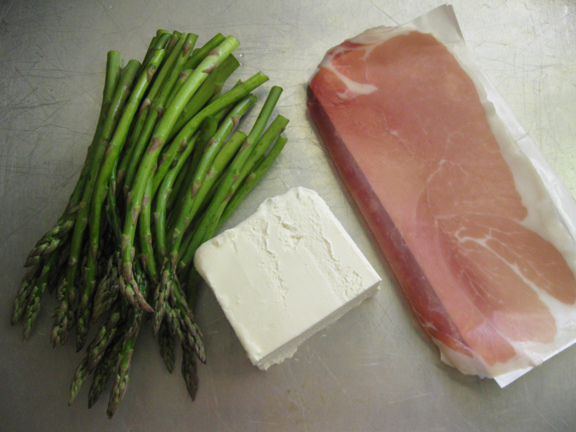 These are the three ingredients: asparagus, cream cheese and prosciutto. First, you’ll want to wash your asparagus and cut off the tips. 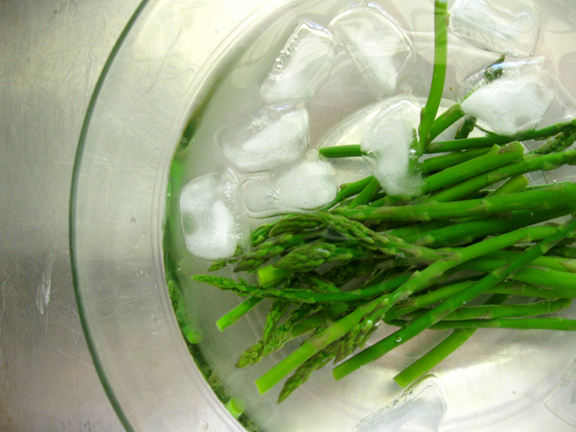 bring the water to a full boil and cook the asparagus until tender, about 3-4 minutes. and immediately place them into a bowl of ice water. This will stop the cooking and maintain the gorgeous bright green color! 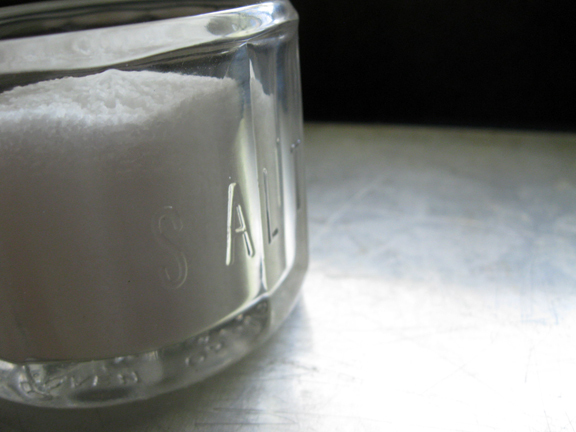 After a minute or two drain them again and then pat them dry with a paper towel and set aside. 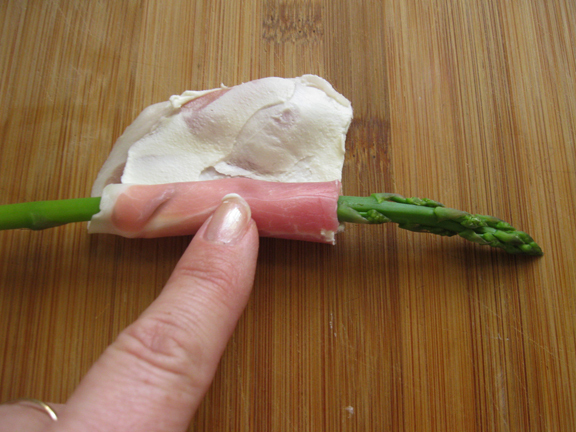 cut the prosciutto into four sections, place an asparagus on the edge, make sure to leave the full tip exposed. 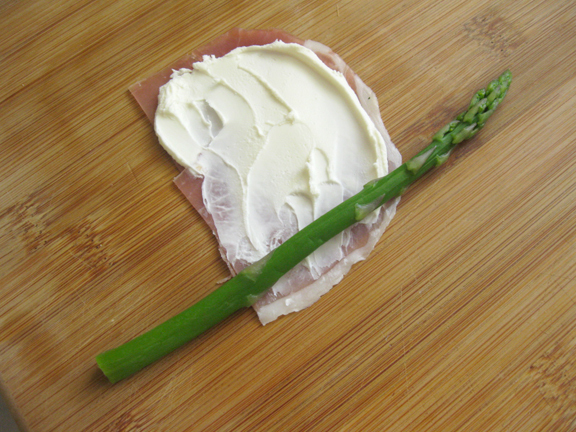 Now gently roll until the entire piece of cream cheese covered prosciutto is wrapped around the asparagus. How easy peasy is that? In no time flat, you’ve got gorgeous little packages of deliciousness just waiting to be enjoyed. I’d like to thank you so much for stopping by and for joining me in the SOS Progressive Dinner Party! If you’d like to join the fight in ending child hunger, you can make a donation to Share Our Strength by clicking here. And if you can’t make a contribution, that’s o.k.- I’m just so glad that you stopped by! and may you never, ever have an empty plate. First you’ll want to wash and trim your asparagus. 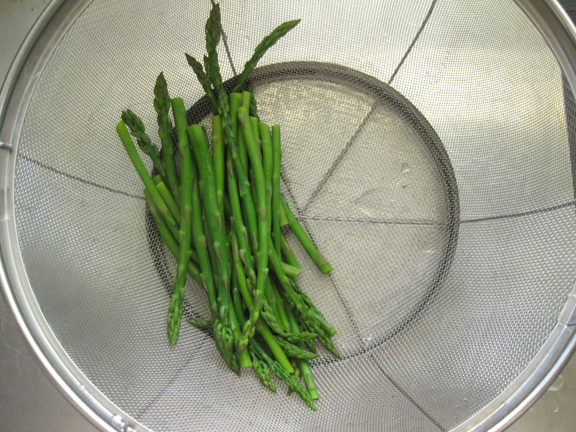 Bring a pot of generously salted water to a boil and cook asparagus until tender, about 3-4 minutes. Drain asparagus and quickly place in a bowl of ice water to stop the cooking process, drain again and dry with paper towels. 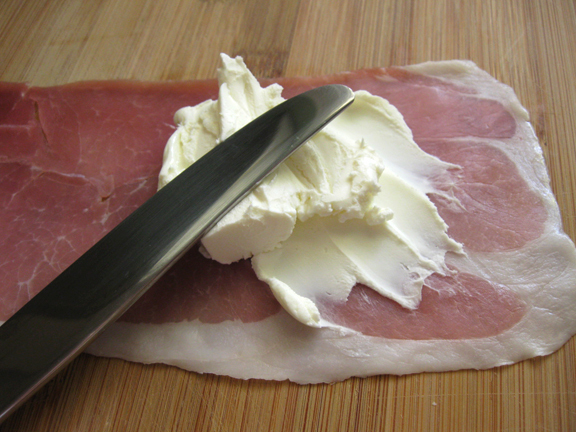 Next spread a thin layer of cream cheese over the surface of one piece of prosciutto and cut into four pieces. Roll each piece with one asparagus, making sure that tip is exposed. This recipe has perfection written all over it! My favorite ingredients all rolled up together! Mmmm! What a delicious and naturally gluten-free appetizer–and very pretty on a holiday table, too. I love an appetizer like this. What a great idea for a cause! Very fun! Perfect appetizer for a very worthy cause. I love how easy these rolls would be to throw together for a cocktail party. Wendy, this look so dang delicious I can hardly stand it. Will you make some for me? amazing appetizer. i haven’t decided on what to take to my holiday party at work, but i think this would be such a winner. i loved the photo. it caught my eye immediately for it’s whimsy and provocativeness!! those colors create a delightful juxtaposition. Great appetizer. I love that it is fast and easy as well. 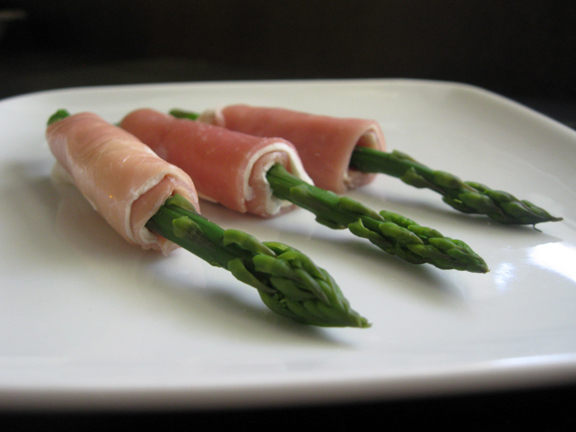 I’ve made a version of prosciutto-wrapped asparagus before. It was sooo good, but I like the addition of the cream cheese in yours! Lovely post. We really do all need to think about our blessings. I’m happy to be part of this event with so many great bloggers. Love seeing the recipes and hope that we raise awareness and lots of money to eliminate child hunger. So pretty for the holidays! These would be great on my buffet this year, actually. Love these Wendy – another recipe that is soooooo easy, yet soooooooo tasty!!! I’ve tried asparagus several times and have never really liked it. However, put enough cheese on anything, and I’ll eat it! I’ll need to try this one! Thank you for the recipe. It’s great to help Share Our Strength with you! Three ingredients. Gluten Free. A winning combination. Thanks for the recipe. And yes, let’s all count our blessings and share our strength with others. (my contribution to SOS is an Arugula Salad with Pomegranate Seeds & Goat Cheese, scheduled to be posted Dec. 7). Oops. I meant Dec. 8. Sorry! These are so pretty and the perfect way to start a dinner party! I’m looking forward to seeing what everyone else serves up over the next week. Lovely job. What a creative and delicious combination. Love it! Oh my gosh…yummy! My mouth is watering–and gluten freeeeeee!!!! 🙂 Thank you! I pray that there will be many contributions to help the children!!! Girl these look delicious! SOS is such a great organization. Wendy, I just love this simple appetizer. I’d love for you to share it in our Get Grillin’ and summer barbecue event (it’s appetizer week).